A HUGE change for us on here! We are posting a recipe here because SO MANY people have asked for it, we needed an easy place to send them. 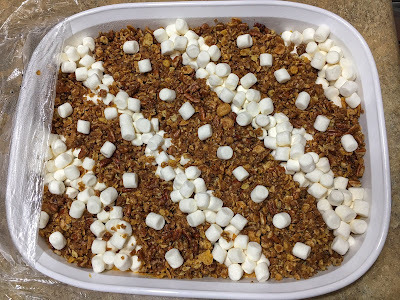 So here it is...our famous sweet potato casserole recipe. For my fanatic photography friends, I apologize for the posting...but it's well worth it! Oh, yes, and especially for the photo below. We weren't exactly expecting to post this today and it got demolished for Thanksgiving! Heat oven to 425°. Place sweet potatoes on a parchment paper-lined baking sheet and bake until soft, about 1.5 hours; let cool for 30 minutes, and then remove skins. Pass potatoes through a food mill into a large mixing bowl; stir in sugar, butter, cream, vanilla, cinnamon, nutmeg, salt, eggs, ginger, and pepper. Pour mixture into a 1.5 quart or 2 quart baking dish (if you want thicker filling, use smaller dish) and smooth top; set aside. This step can be done the evening before and stored overnight, covered in the refrigerator.